One of the things that really rankled about Rachel Reeves’ attempt at Tory talk in yesterday’s Observer was the (observable) fact that she didn’t need to. Some could point out that Labour’s share in 2010 was only 29 per cent – around 18.8 per cent of all available votes – but this just proves the point. Neoliberal New Labour were very close to the Conservatives in outlook and policy and most people in the UK don’t want that. But Rachel Reeves indicated that these policies would continue on her watch, and that’s why people reacted so strongly against the Observer interview. Perhaps Labour should have done some research on this. Yes, the party has its ‘Your Britain’ website, for members to bring forward ideas – but I’ve been there and didn’t like it. It seemed needlessly complicated, with efforts made to get people discussing particular policy areas at particular times when it would have been better to let people just say what they want – when they want – and sort it out at the receiving end. Besides – that’s just for members. How much research has Labour done on the doorstep? What do people who aren’t aligned to either main political party want? That is where Labour will get its votes. Even pointing to research by the polling organisations doesn’t help here. 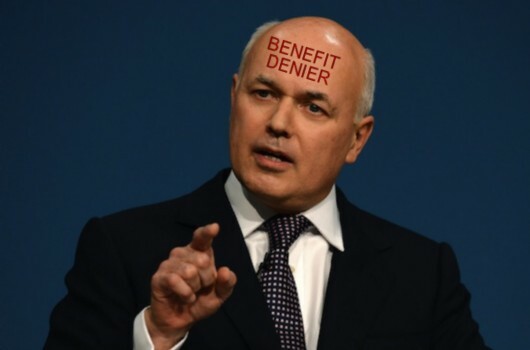 Ipsos-MORI famously polled more than 2,500 people about the benefit cap earlier this year, and Iain Duncan Smith was delighted to announce that a significant majority of respondents were in favour. It was left to this very blog to break the news that only 21 per cent of those respondents knew enough about the cap to give an educated opinion. It would be informative to know how many – of all the respondents, not just the 21 per cent – were actually affected by it. All of this is a great shame that may worsen into a missed opportunity. There are some terrific ideas around at the moment and all Rachel Reeves – and Labour as a whole – has to do is look around for them. The Fabian Society website carried an article entitled Welcome to DWP the other day, in which most current proposals for reform of the system were rejected – which is a telling indictment of the state of the nation in itself. The stated reasons were that they would reduce the incomes of poor families (no thank you, Labour! You’re not going to out-Tory the Tories!) or fatally undermine universalism. But among the ideas that were there, it was suggested Labour needs to reform individual benefits before setting its planned upper ceiling on the benefits budget. To that, I would add that the ceiling needs to be described as a proportion of a Labour government’s overall budget – not limited to a particular sum of money. This is the only way to keep it fair as inflation increases costs and devalues the pounds in our pockets, year on year. Reducing unemployment, involuntary part time work and low pay by getting people into full-time jobs on a living wage could cut billions off the benefit bill (and boost the tax take at the same time). For right now, the article stated, La Reeves needs to work on Labour’s perception problem – the false image created for it by an unsympathetic mass media, that it is ‘soft’ on benefits. This is based on misconceptions; only a quarter of social security goes on working-age people without jobs, and benefit fraud is – as has been explained ad absurdum on this site – miniscule. Before the recession, Labour had cut the number of people out of work and really made work pay (with tax credits – not necessarily a great way forward, but a start – and these could be eased out of service as pressure was exerted on employers to adopt living wages). The social security budget was falling, not increasing. That’s what Rachel Reeves needs to be saying. Labour’s policies were working. The public has been misinformed. A new Labour government could create a winning formula again. It could happen – if Labour stops being the Party of Plastic Tories and starts being the Party of the Worker once again. One lie leads to another, as Iain ‘Returned To Unit’ Smith seems to have found out – now that he has started, he can’t stop for fear that he’ll be found out. Tough. The evidence is available for all to see. His latest attempt at hoodwinking the public is a press release, Public think benefit cap claimants should work or move, in which even the headline is a lie. It aims to publicise the results of a survey by Ipsos-MORI, examining public attitudes to the cap. The survey was carried out among more than 2,000 people who were selected to be representative of the UK as a whole. “The vast majority (70 per cent) of the public think people affected by the benefit cap should be prepared to find jobs or work more hours,” the piece begins. This is accurate, according to the survey being quoted – but it is based on the premise that the benefit cap should be set at £26,000 per year for a workless family, which is significantly lower than what was originally advertised by the DWP – the income of an average working family. The DWP, imposing the cap, drummed up support by saying it would limit the amount workless families could receive to the same as the average income of a family in work, claiming that this was £26,000. In fact, a working family claiming all the benefits to which it is entitled can get £31,000 – so the cap means workless families are at least £5,000 per year worse-off, a huge gap of 16-17 per cent. “Two-thirds (65 per cent) say they should be willing to move to a cheaper property,” the release claims – but the Ipsos-MORI report’s summary makes it clear that support for the policy drops to 44 per cent – a minority – and opposition rises to 26 per cent if it means those benefit claimants affected by the cap have to move to other areas to find more affordable accommodation. The press release, which came out to support the government policy ‘Simplifying the welfare system and making sure work pays’, continues: “Independent research published today (10 October 2013) shows that 60 per cent support the cap even if it means that those affected have to take a job, regardless of the pay.” So now it seems that making work pay is not the objective; cutting wages is the real plan. “The Ipsos MORI report finds around three-quarters of the public support the benefit cap in principle.” This, at least, is accurate and is no bad thing. Benefits should be lower than wages – they are a safety net that should enable people to carry on living while they find paying work. But in return, employers need to pay a living wage, ensuring that nobody in work has to claim any benefit at all. That, at the moment, is sorely lacking in the UK. “58 per cent think that politicians needed to do more to reduce the welfare bill.” But they weren’t asked how they thought this should be done, or whether politicians were doing the right things. “50 per cent think that benefits are too generous.” Among those who’ve received benefits this drops, but surprisingly only to 45 per cent. Among those who haven’t received benefits, 62 per cent thought them too generous. “11 per cent think the benefits system is working effectively.” But they weren’t asked whether the Conservative-led Coalition was to blame for the poor performance. At this point, the press release stops quoting statistics – but there is one further piece of evidence that people need to know. It relates to what the people who were surveyed knew about the benefit cap before they answered the questions. Only 29 per cent knew even a fair amount about the cap before answering the survey’s questions. Of the rest, 42 per cent said they knew “just a little” about it, 18 per cent said they’d heard of it but knew nothing at all about it, and eight per cent had never even heard of it. So this survey – put out by the DWP as a measure of public support for the Benefit Cap – is in fact a measure of public ignorance. Why should anybody accept these findings as authoritative? How can we accept the 70 per cent view that people affected by the cap should be prepared to find jobs or work – that’s fewer than those who admitted they don’t know much about it! In fact, none of these statistics can claim to be authoritative because only a tiny minority of those surveyed knew enough about the subject. Lie. It shows that most of the public are ignorant about the limit. The successful delivery of a benefit cap set at 17 per cent less than average income shows that he is committed to returning unfairness to the benefit system. Lie. The press release itself states that people are being pressurised into any work they can get – whether it pays or not. Support is not available to get people back into jobs because the jobs aren’t there. And Universal Credit does not work. 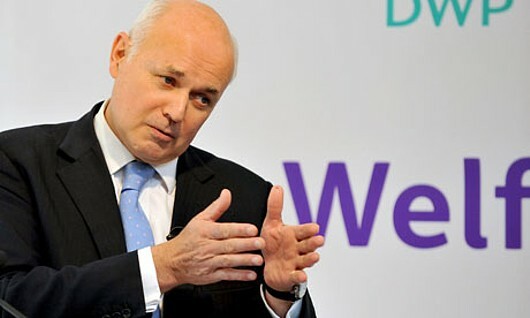 The release goes on to state: “Since claimants were first notified of the benefit cap in April 2012, Jobcentre Plus have helped around 16,500 potentially capped claimants into work.” The wording is very careful; notice no mention is made that they moved into work specifically to avoid the cap – Smith and others have been reprimanded over such claims in the past. But the context suggests that the benefit cap is what motivated these people to get jobs, and that is unsupportable as well. The long-feared roll-out of the benefit cap happened today. There has been a great deal of shouting about it from all sides, but it is possible to get a balanced view – by linking news articles from opposing sources such as, say, New Statesman, the BBC and the Daily Mail. Yes, the Daily Mail. I’m serious. 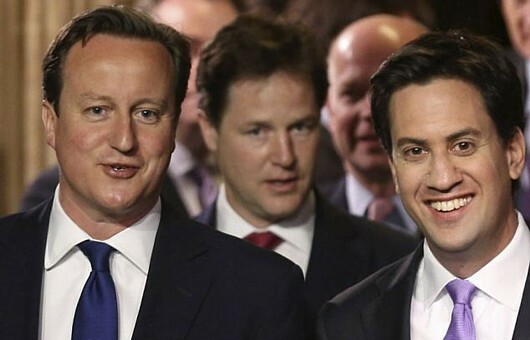 The benefit cap is one of the Coalition’s most popular policies – not the ONLY popular policy; believe it or not, a sizeable proportion of the population think Cameron and Co are doing a good job. New Statesman quotes a YouGov poll in which 79 per cent of people, including 71 per cent of Labour voters, support the cap – with just 12 per cent opposed. The Mail quotes Ipsos Mori, whose poll states 74 per cent support the cap. “The claim on which the policy rests – that a non-working family can be better off than a working one – is a myth since it takes no account of the benefits that an in-work family can claim to increase their income. For instance, a couple with four children earning £26,000 after tax and with rent and council tax liabilities of £400 a week is entitled to around £15,000 a year in housing benefit and council tax support, £3,146 in child benefit and more than £4,000 in tax credits. “Were the cap based on the average income (as opposed to average earnings) of a working family, it would be set at a significantly higher level of £31,500. The suggestion that the welfare system “rewards” worklessness isn’t true; families are already better off in employment. Thus, the two central arguments for the policy – that it will improve work incentives and end the “unfairness” of out-of-work families receiving more than their in-work equivalents – fall down. “Contrary to ministers’ rhetoric, the cap will hit in-work as well as out-of-work families. A single person must be working at least 16 hours a week and a couple at least 24 hours a week (with one member working at least 16 hours) to avoid the cap. 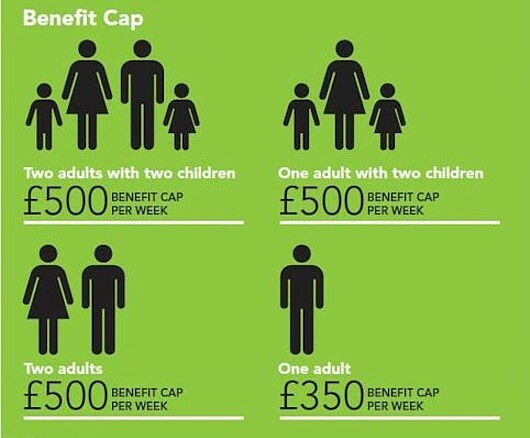 The cap applies regardless of family size, breaking the link between need and benefits. As a result, most out-of-work families with four children and all those with five or more will be pushed into poverty (defined as having an income below 60 per cent of the median income for families of a similar size). 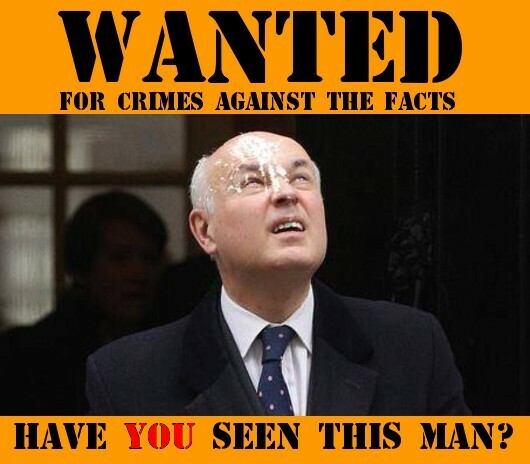 Duncan Smith has claimed that “at £26,000 a year it’s very difficult to believe that families will be plunged into poverty” but his own department’s figures show that the poverty threshold for a non-working family with four children, at least two of whom are over 14, is £26,566 – £566 above the cap. The government’s Impact Assessment found that 52 per cent of those families affected have four or more children. “By applying the policy retrospectively, the government has chosen to penalise families for having children on the reasonable assumption that existing levels of support would be maintained. While a childless couple who have never worked will be able to claim benefits as before (provided they do not exceed the cap), a large family that falls on hard times will now suffer a dramatic loss of income. It was this that led the House of Lords to vote in favour of an amendment by Church of England bishops to exclude child benefit from the cap (which would halve the number of families affected) but the defeat was subsequently overturned by the government in the Commons. “The DWP has released no official estimate of the likely increase in child poverty but a leaked government analysis suggested around 100,000 would fall below the threshold once the cap is introduced. “Most of those who fall foul of the cap do so because of the amount they receive in housing benefit (or, more accurately, landlord subsidy) in order to pay their rent. At £23.8bn, the housing benefit bill, which now accounts for more than a tenth of the welfare budget, is far too high but rather than tackling the root of the problem by building more affordable housing, the government has chosen to punish families unable to afford reasonable accommodation without state support. “The cap will increase homelessness by 40,000 and force councils to relocate families hundreds of miles away, disrupting their children’s education and reducing employment opportunities (by requiring them to live in an area where they have no history of working). The BBC opened with a much sunnier perspective that has caused Vox Political to send a query to the UK Statistics Authority. According to the report, “More than 12,000 people have moved into work after being told about the benefits cap, the government says.” Oh, really? 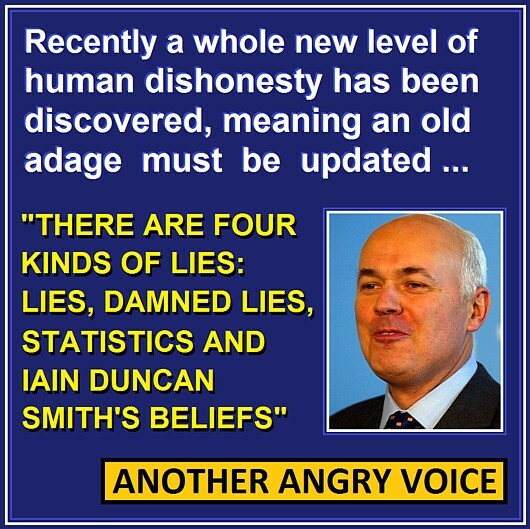 Didn’t Iain Duncan Smith get into trouble only a few months ago, for reporting that 8,000 people had moved into work after being told about the cap? Only last week, his own officials told the Work and Pensions committee he had ignored small print in their reports, stating clearly that he could not use the figures to claim that any “behavioural change” had taken place. In other words, the Secretary of State ignored his advisors to make a political point that had no basis in fact. He lied to the public. How do we know he isn’t doing it again? A letter to Mr Dilnot is in order, I think. Finally, to the Daily Mail, where it was reported that “Cabinet minister Iain Duncan Smith today accused the BBC of launching a ‘politically-motivated’ attack on government plans to cap benefits at £26,000. That’s anecdotal, and may not be used to suggest a national trend. He is using lots of little cases to claim that his cap will work. So we go from the cold, hard facts, to the comforting fantasy, to the shattering of the Secretary-in-a-State’s temper on national radio when the flaws in his scheme were exposed. Mail readers, in that paper’s ‘comment’ column, seem to have supported his viewpoint – despite the facts. Will their opinions change when the horror stories start appearing – or will they stick their fingers in their ears and scream, “La la la I’m not listeniiiiiing!” – as Mr… Smith did (figuratively speaking) on the Today programme?